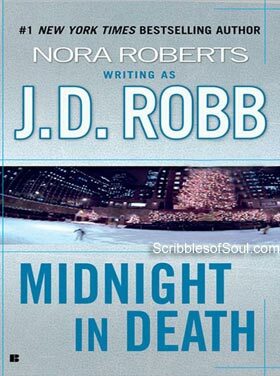 The ominous opening lines of my latest read Midnight in Death by J. D. Robb aka Nora Roberts sent a shiver down my spine. After hobnobbing with witty Gauri and impressive Holmes, I thought a pure murder mystery would be fun to explore. And, as I began reading Midnight in Death, at least, initially, I felt I was on the right track. The story revolves around Lieutenant Eve Dallas, a cop in New York special force, in 2058, married to one of the richest businessman Roarke. Apparently, it is Christmas Eve and instead of celebrating, our heroine is rushing towards the city center, where Judge Wainger is found dead. A cursory glance convinces Dallas that murder is the handiwork of a psychopath David Palmer, whom she herself arrested three years ago. But David was locked in an off planet rehabilitation center and it was next to impossible for him to escape from there. However, as Eve looks a little closer, she discovers more evidences that point towards the involvement of David. Apparently, all those who played a role in his case are listed as the potential targets, Eve herself figuring on the last number. Will Eve be able to trace David timely? Will she be able to prevent more murders? Or will David prove to be too elusive for her the second time round? As Eve runs from the icy exteriors to the tasteful interiors of Roarke Palace, dividing her attention between her husband’s gentle caresses and her assistant’s able searches, Robb weaves a tale of mystery, suspense and gore. The novel did begin well and I was hoping to read a good tale, but sadly J. D. Robb was not able to portray her characters convincingly. Her narrative shuttled maniacally between a romance and mystery, and at the end of the day, failed to do justice to either of the two genres. The pace of the novel was good, but the forced romantic scenes slowed it down. Whenever Eve took interest in solving the murder mysteries, the narrative picked up, but it was almost always followed by some distracting love moment. And, then even the mystery became lackluster as no insights were offered into the psyche of murderer or his poor victims. The writer simply tried to create an atmosphere of blood and gore, by painstakingly describing the tortuous killings, emphasizing more on the nakedness of victims than the physical or mental cuts and bruises they suffered. All through the narrative, I kept hoping for a sudden change in tone or a strange twist that would bring suspense back into the story, but I was totally disappointed. Superficial references were of course, made to the new technologies America would be using in another 50 years. But, sadly the Auto chef and off planet transpo were hardly sufficient to rekindle my interest in the story. And, the final death blow came with the unimpressive climax, which got over in a blink. Before my mind could even register the much hyped end, the story was over. I guess, Midnight in Death is just not my kind of book. It came across as a poorly edited version of the movie ‘Saw’. The concept was not bad, but was very shoddily executed. Though, the publisher (Berkley) did a good job by including an excerpt of the first novel of the series Naked in Death, so that the readers get familiarized with the background of the story and initially it did help in piquing my interest. But, a good beginning is hardly enough, it has to be followed up by a good story and unluckily the straight downward slope of the plot just failed to do so. I guess, even murder mysteries can not thrive on murders alone, there have to be mad twists and crazy turns. And, sadly Midnight In Death had none of these. But, before wrapping up this review, I would like to point out that the writer of present novel J. D. Robb is actually a best selling romance novelist Nora Roberts. And, though, I am totally disillusioned with her Midnight in Death, I have not written her off as yet and would love to give a chance to her romance genre. If you have any suggestions, feel free to Comment.